I’m all about chilled salads when the hot and humid weather sets in. Lighter fare keeps me feeling cool, refreshed, and not weighted down. 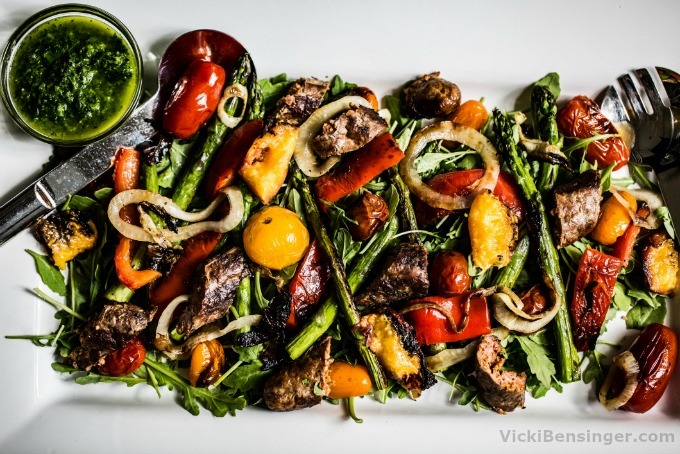 This Grilled Vegetable & Chorizo Salad with Chimichurri hits the spot. No one says you have to stay with a raw vegetable salad, although I enjoy those as well. 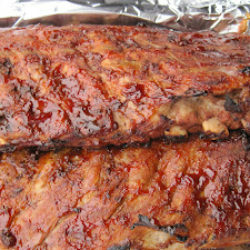 However, a salad with a variety of flavors, texture, and protein is simply more interesting to indulge in. 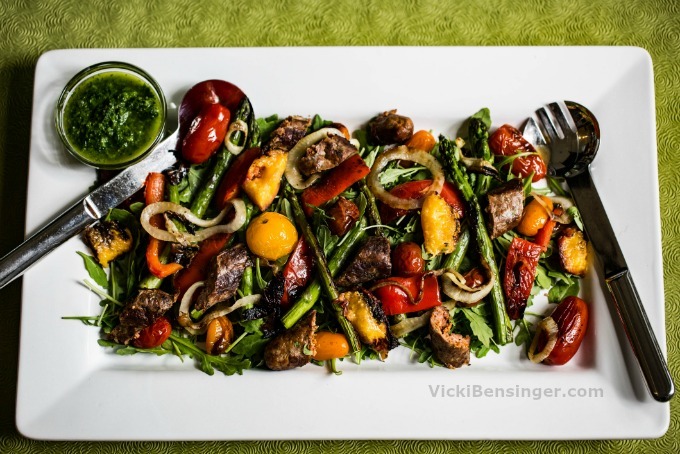 I especially like the chimichurri sauce with my Grilled Vegetable & Chorizo Salad. 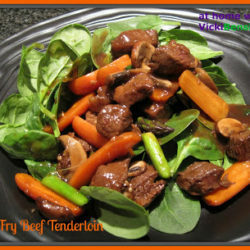 It lends a fresh and light taste, that truly enhances the flavors of each component in this dish. Chimichurri may sound complicated but it’s actually so easy to create. All you need to do is dump the chimichurri ingredients into your food processor, give it a wiz, and it’s done. How simple is that? For my salad I chose to use arugula for that peppery and savory taste. Pairing it with the spicy Chorizo and Grilled Veggies leaves you feeling completely satisfied. 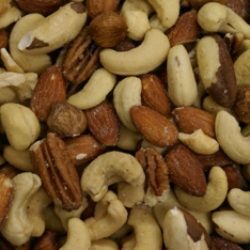 Any one of these proteins would lend a new flavor to this salad. You get the picture? You’re the chef – create whatever sounds appealing to your palate! 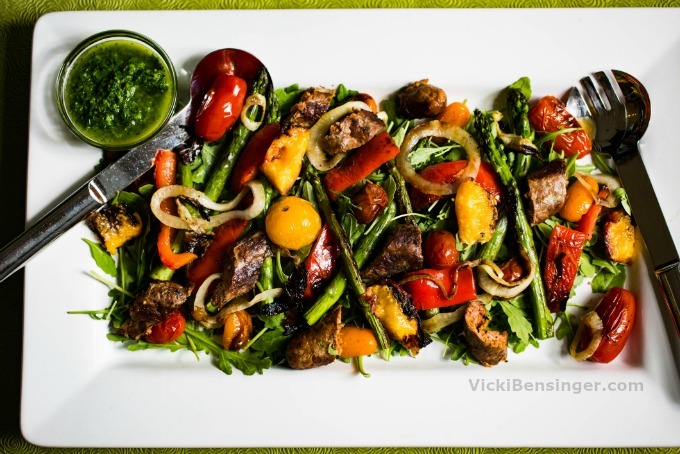 I hope you’ll give my Grilled Vegetable & Chorizo Salad with Chimichurri a try – I think you’ll love it! 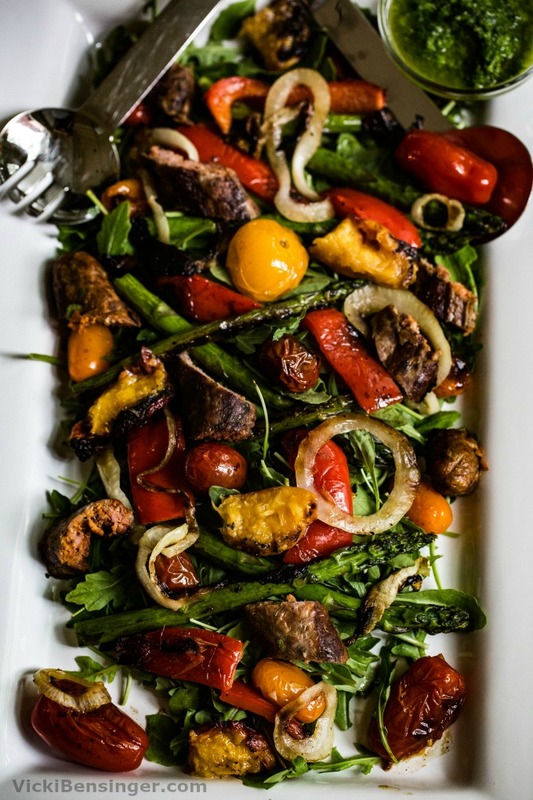 For a hearty salad try this Grilled Vegetable & Chorizo Salad with Chimichurri. Chimichurri: process herbs, garlic, onion and jalapeño in a small food processor until blended. Add oil and process until smooth. Then add vinegar, and season with salt and pepper, and combine. Heat grill to medium-high. Drizzle chorizo with olive oil and grill, turning occasionally, until browned and cooked through (3-4 minutes). 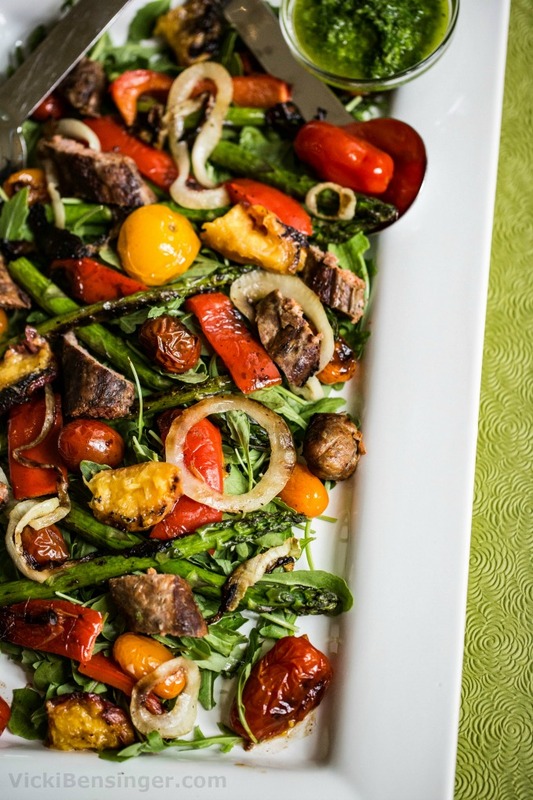 To a grill pan add pepper, tomatoes, asparagus, and onions, and drizzle with olive oil. Place on grill stirring occasionally for about 10 minutes until asparagus are bright green and veggies are golden. Slice peppers into strips. Set Arugula on a platter. Add chorizo, asparagus, peppers, tomatoes, peaches, and onion over the top. Serve with Chimichurri on the side or drizzle with a little chimichurri and toss to combine. This looks wonderful Vickie, a perfect summer meal! Thanks Chris it was so good. The chimichurri was a nice change from the typical salad dressings. I definitely crammed a lot of different flavors in here. That one addition of the grilled peaches was so perfect making it savory with a bit of sweet. I know isn’t that true. I think years ago many didn’t have a/c so grilling outside kept the house cooler than cooking indoors. We grill year round even if it’s freezing. Chimichurri is so good! To look at it you wouldn’t think it’s that big a deal but add it to dishes and wow it totally transforms the dish. It’s a healthy, colorful, and flavorful salad! 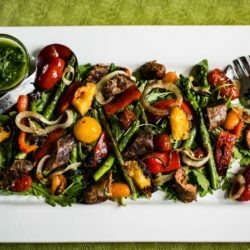 Chimichurri, veggies and chorizo!!! This sounds like one amazing salad!!! 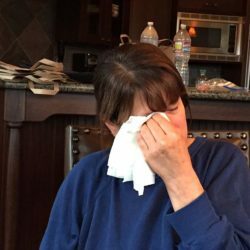 Happy 4th, Vicki!! Thanks Liz it was! It didn’t last too long around here. Happy 4th to you and your family as well.